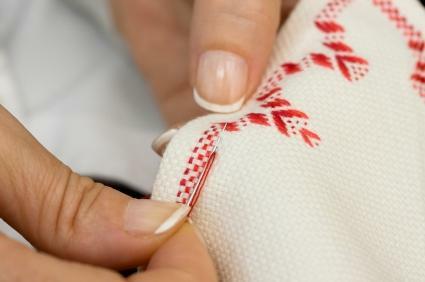 People that like to ensure their embroidery is carefully crafted, stitch by stitch, may enjoy hand embroidery patterns. Unlike machine embroidery patterns, these patterns are very simple. Often they are a print of a design that the crafter can transfer onto a piece of fabric and replicate with thread. Sometimes they specify the stitches the person should use, but often they leave it up to the individual's discretion. If you need more information about basic stitches, Craftown has a good overview. The Moses House - This site has a new free pattern available each week. Needlecrafter - This site has a large library of patterns, including both modern and period designs. Images include flowers, fruit, animals, monograms, people and holiday motifs. Tipnut - This site is perfect for anyone that wants to embroider samplers or kitchen towels. It includes a set of kitchen proverbs patterns, with sayings such as "a watched pot never boils." Di van Niekerk - This site has several flowery and ornate designs, good for borders and cornering. You can also download coloring pages and use them as embroidery patterns since they usually have clean, solid lines. Patterns are pretty inexpensive, even if you have to purchase them. Some bookstores, like Books a Million, sell craft pads, and larger fabric stores are almost guaranteed to have them in stock. You can also check out large craft stores. You may even find a few patterns at a general merchandise store, like Walmart, in the sewing section. Once you have your pattern in hand, you need to transfer it to the fabric you want to use. Lay your fabric on a flat and even surface. Place a sheet of carbon paper shiny side down, on top of the fabric where you want your pattern to be. Lay your pattern on top of the carbon paper. Pin both the carbon paper and the pattern to the fabric so it doesn't move. Trace over the pattern with a dull pencil or a pen, pressing firmly to ensure a complete transfer. If your fabric is too dark for the carbon to show, you'll have to use transfer paper instead, which you can find at many fabric stores. If you'd like to try a transfer method that was popular in the 15th century, you can prick and pounce. To do this, make holes in your pattern following the lines at about every eighth of an inch. When you're finished, pin your pattern to your fabric, as above. Finally, place your "pounce," which is a powdery substance, on top of your pattern. You can use charcoal, chalk or cinnamon, for starters. Rub the substance into the fabric through the holes in the pattern until you have a pretty good print. Shake off the excess pounce and remove the paper. If you don't want to deal with transferring a pattern, you can draw your own freehand pattern directly on your fabric. Just be sure to use a writing implement that will not poke through to the other side. If this pattern turns out especially well, it may be worth considering peddling your wares at a craft fair or online. It could become your personal signature.